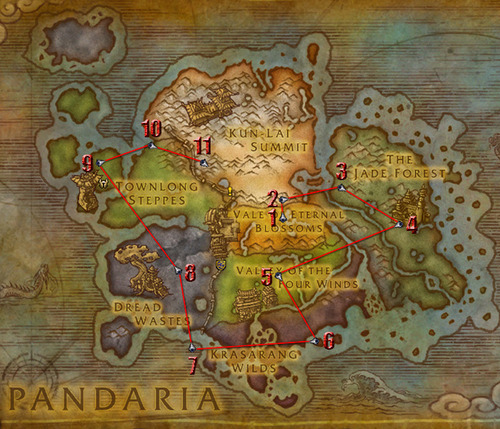 I thought I saw someone post a graphic of the most efficient route to hit all of the trainers in Pandaria. Did I just dream this up or does it exist? That's great. I must have imagined that there was one with the new elite pets on it too. Thanks. Shmoooey wrote: That's great. I must have imagined that there was one with the new elite pets on it too. Thanks. My TomTom macros. Note Aki wouldn't fit on the first one so I put it in the last one. Last edited by GilroyKilroy on March 7th, 2013, 8:00 pm, edited 1 time in total. Awesome, thanks. That looks so much more efficient that what I've been doing. 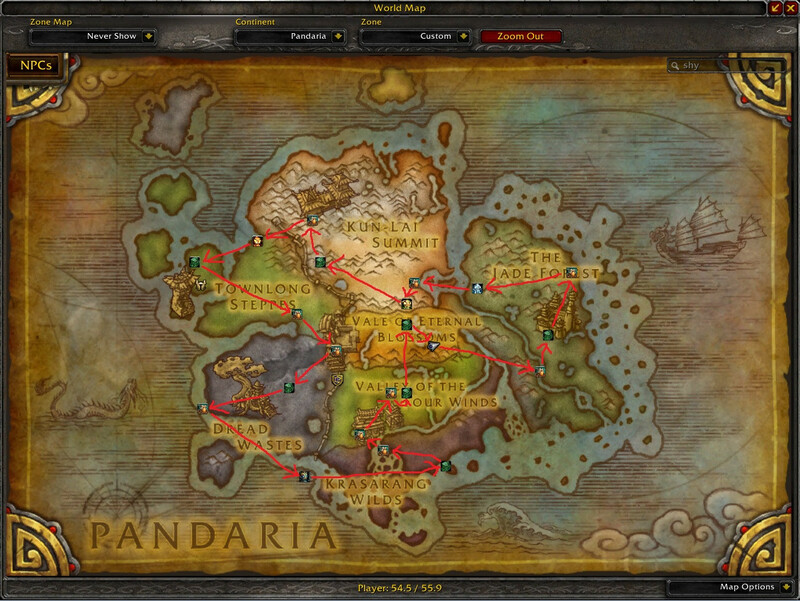 Here's an alternate route, not as flashy-looking. I'm not a flashy kind of person. Thanks all for these. 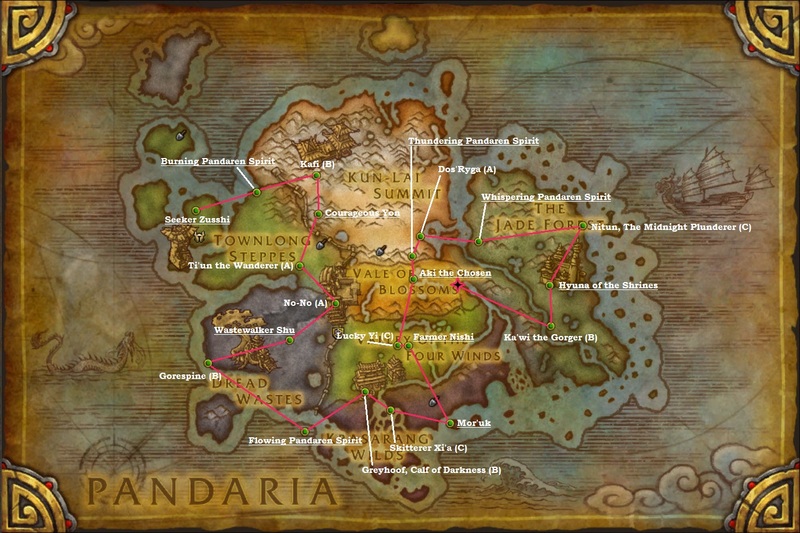 Very efficient routes makes for more gaming fun. 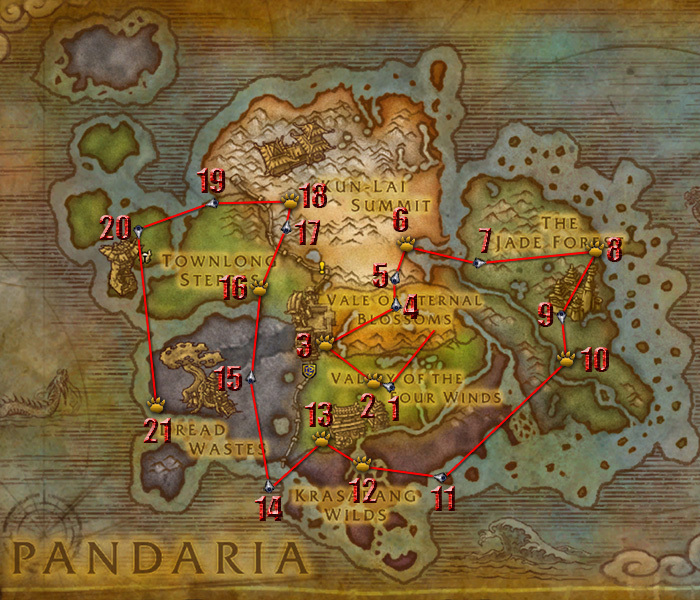 You start in your MoP hub, pick up the 3 BoF dailies, off to Jade Forest, cross the BMAH on the way, check if anything is up for today. Take out a BoF first, then activate pet treat first at Hyuna. 2nd pettreat is activated before Water Tamer if you're having a really bad day, if really really good day it lasts till youre done. Usually refresh is before Nishi.